Foursquare’s CEO and co-founder Dennis Crowley likes to draw comparisons to Twitter when talking about Foursquare, emphasizing how his company is evolving in the hands of its users like Twitter has. But when it comes to revenue and advertising, Foursquare is focusing on a different advertising strategy for extracting revenue from its network. That’s the impression I got after listening to Crowley speak Monday at an Advertising Week event Monday. While he didn’t make the direct ad revenue comparison, he shared about how the location-based social network’s early ad product called promoted updates is doing since launching in limited trials with national retailers this past summer. He didn’t talk numbers, but he said a “high percentage” of people who are presented with promotions while searching for places or getting recommendations through Foursquare’s Explore engine are walking into the promoted stores. Foursquare didn’t provide more context around the performance of its ads. As Foursquare has learned to harvest more and more data and turn it into tailored recommendations, it’s become more of a personalized mobile local search engine for its 25 million users. Since it not only understands what’s near a person but what is relevant to them based on their tastes, their friends’ tastes, the time of day and other signals, Foursquare is able to generate better results than a traditional search engine, said Crowley. 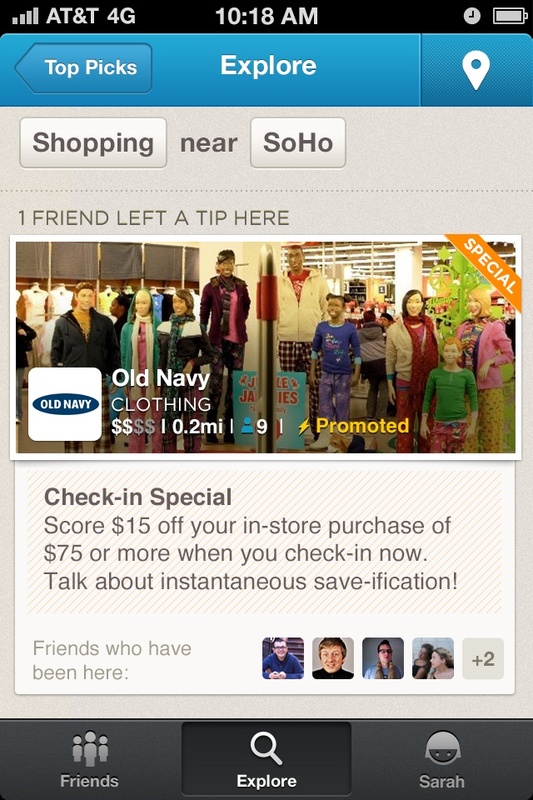 Foursquare, which launched in 2009, has been slow in ramping up with ad products. But Crowley said its free merchant tools have allowed businesses to contribute their own content, first with specials and more recently with news updates. That’s become a popular part of the experience for more and more users, who turn to Foursquare to save money, Crowley said. Now, with fully paid update promotions from businesses and retailers, the merchants are able to get in front of users with more targeted messages which many users are happy to accept as just more valuable content. 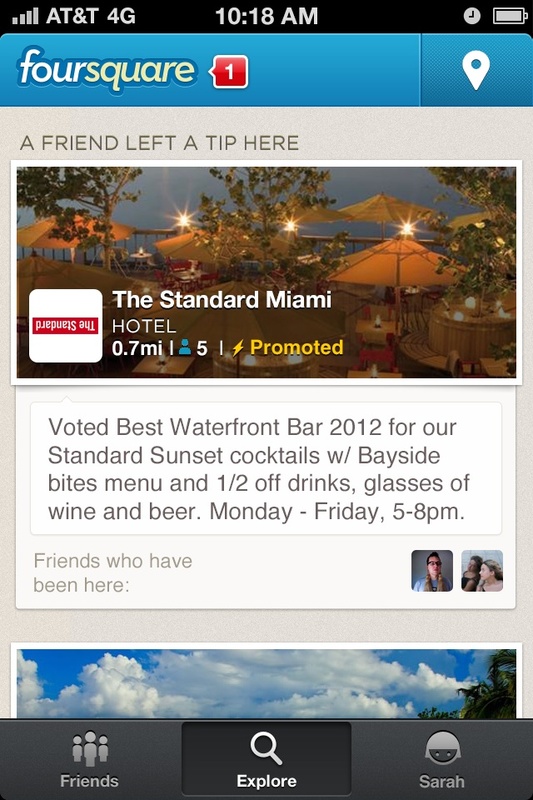 As I wrote before, Foursquare still has a lot to do with its ad products. But the fact that it is becoming a local search engine that can close the loop, or confirm the effectiveness of an ad, through check-ins and card-synced American Express (s axp) transactions is putting it in a great place to make some money. As David Pakman, a partner at Venrock pointed out recently, not all traffic is the same. Advertisers, he predicts, will direct their spending toward transactional content that has a lot of intent and can easily convert to a purchase. That, he said, will win out over a topical content found on Facebook (s fb) and Twitter, which produce content with low signals. Chris Dixon, who is an investor in Foursquare, has also played up Foursquare’s revenue potential saying its user intent data positions it well against other social networks: “Foursquare is the one of the few (only?) social networks with purchasing intent. Which means monetization can be non-annoying and high RPM,” he wrote in a tweet.